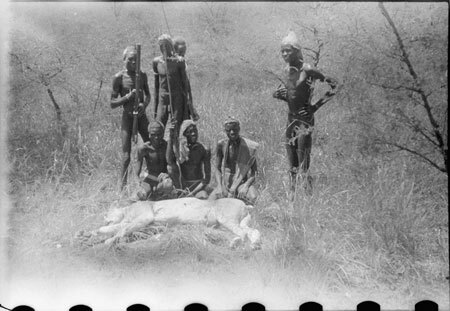 A group of Nuer porters standing behind a lion shot by Thesiger in Western Nuerland, one of forty lions he shot in southern Sudan. He later wrote that lions were then considered vermin in the region, and were especially abundant in the Western District. One of the porters is holding a gun, but is unlikely to have been given it to shoot with. Morton, Chris. "Nuer porters with lion" Southern Sudan Project (in development). 03 Jan. 2006. Pitt Rivers Museum. <http://southernsudan.prm.ox.ac.uk/details/2004.130.36018.1/>.